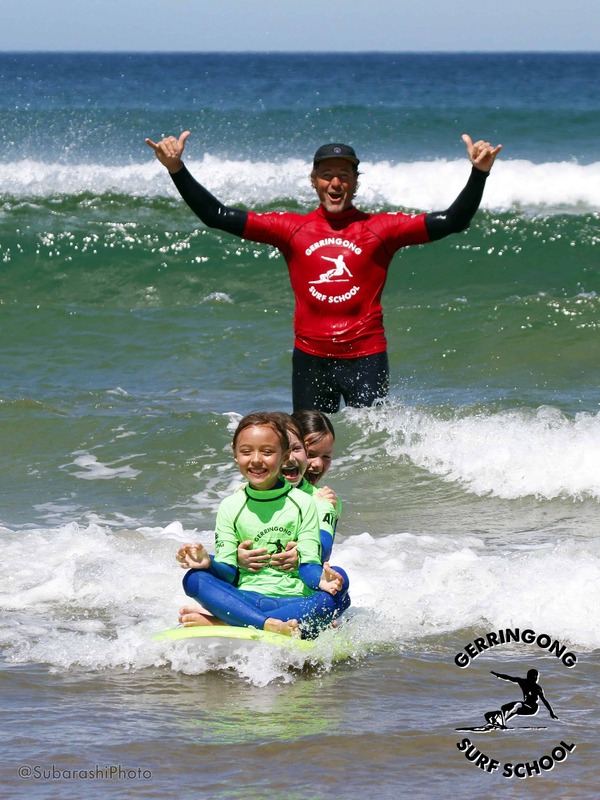 Welcome to Gerringong Surf School! Rusty Moran, who has over 35 years of surfing experience. Friday, April 19th to Monday 22nd. For kids aged 4 and up. We now provide a free school pick up service for the local Gerringong Primary School kids. Learn to surf with the “growth mindset group” of women under Rusty’s coaching. 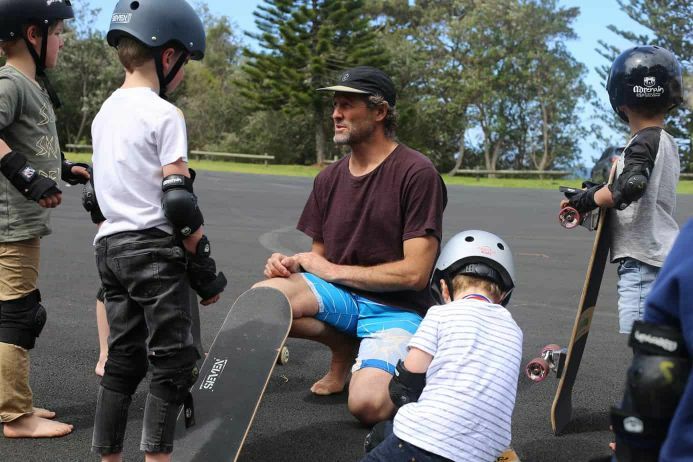 Surf Skate & Meditate is our three day kids holiday camp, which will be running every day during the Christmas holidays from 27 December 2018 to 27 January 2019. Learn to surf or improve your technique with professional one to one coaching. We provide expert tuition and video analysis to see how you can improve your technique. Learn to surf with your family or bunch of mates. Feel the glide on your first lesson! We provide all the gear you need and we will show you the safe way to get amongst the waves and we will have you up and riding in your first lesson. 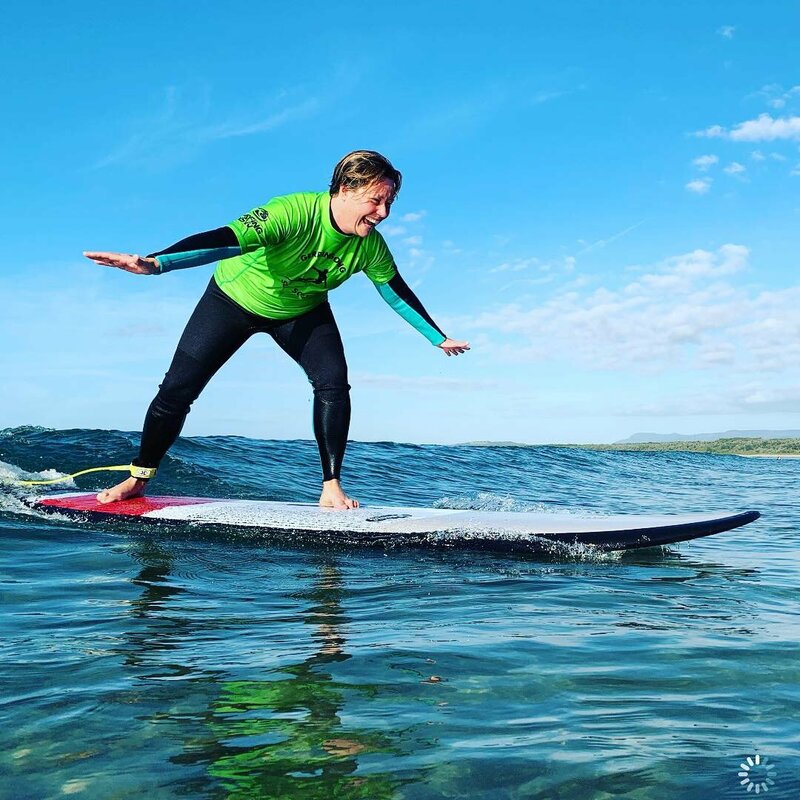 We provide group and individual (private) lessons for all levels, where we will teach you the correct technique for standing up and turning as well as fitness exercises to get in and stay in great shape for surfing. For advanced surfers, we provide in-depth coaching one on one to really help with improving everyday surfing, technique correction using video analysis and simulation on the smoothstar skateboards. I have the utmost respect for the ocean and always put safety first. Our beginner lessons are at Seven Mile Beach, Gerroa, the best learn to surf beach in Australia. The waves here are small and break slowly, which gives the beginner surfer long comfortable rides without being nervous about being dumped. Long term surfers who are experienced in all conditions. Working With Children (WWC) checked. To see the pure joy on Byron’s face after his skating lesson with Rusty was such a treat. Watching how Rusty is able to connect with the kids and celebrates their achievements in such a positive way is heartwarming. “The Squeeze” Soft top SUPs are used for all adult beginners. “The Spud” full soft board SUPs are used for all kid beginners. 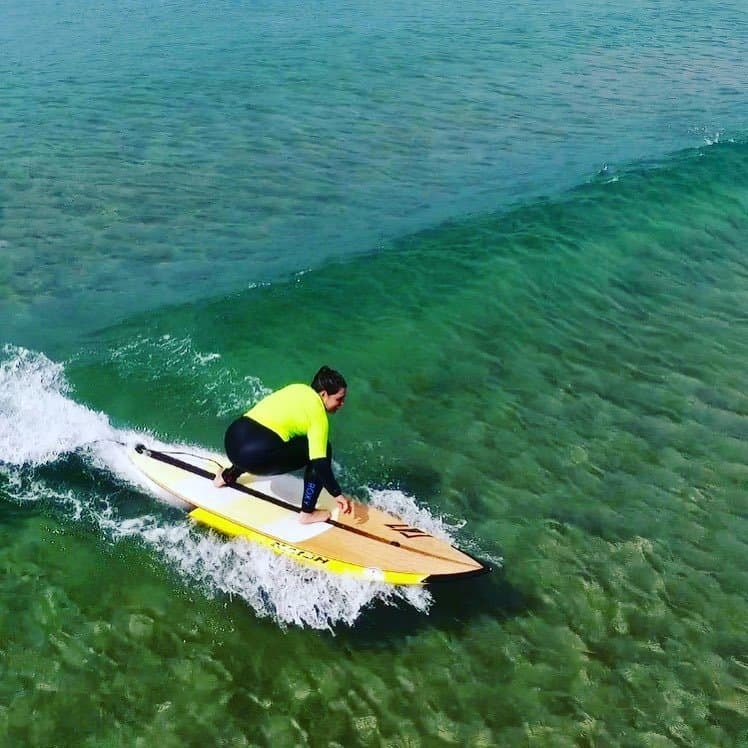 Intermediate to advanced surfers are provided with Epoxy fibreglass boards such as the Hayden Shapes “Hypto Crypto” or the “Double Down” by 7S. We provide wetsuits and strong legropes, as well as rashies. Protection gear by “Exite” skate. Our 8 year old daughter has been learning to surf with Rusty at Gerringong Surf School for over a year now. Her confidence in the water, wave knowledge, and safe approach to surfing have sky rocketed since starting the classes. 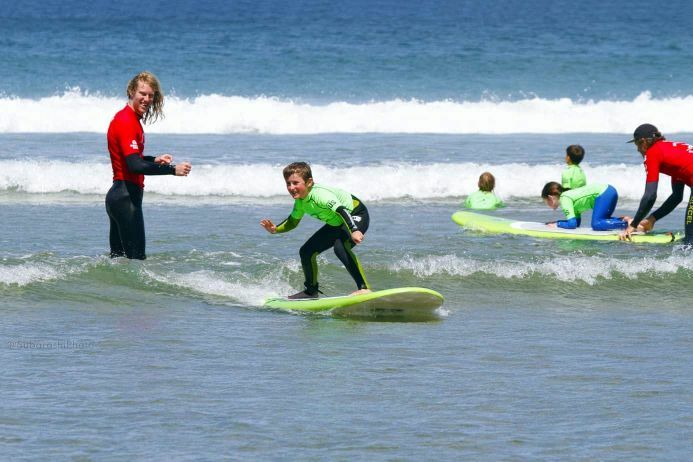 Rusty’s infectious enthusiasm for teaching surfing and giving the children a positive, confidence building start, to becoming water men and women is inspiring. 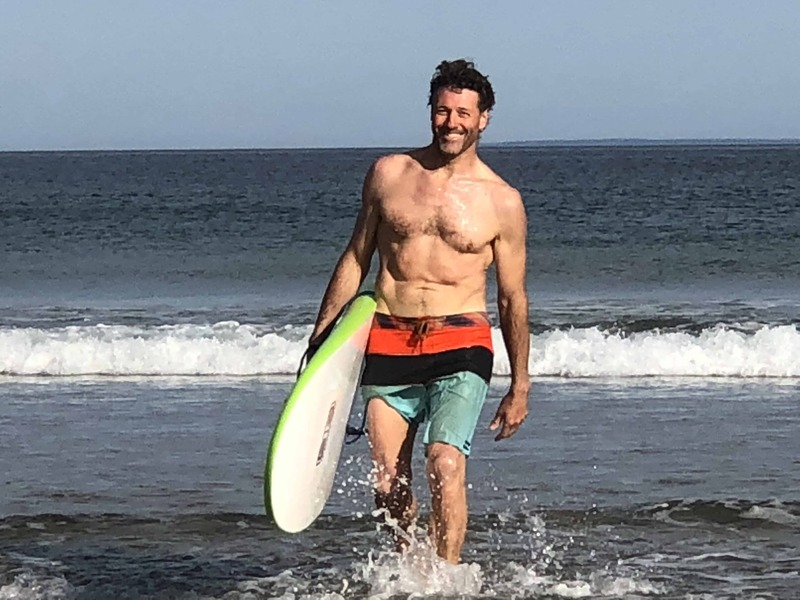 Rusty is 46, has been married to Vanessa for 21 years, has four kids (aged 2 to 17) and has been surfing for 36 years. During his twenties, Rusty spent every summer in Hawaii chasing the biggest waves he could find, and was fortunate to cut out a career as a professional big wave free surfer for a few years. 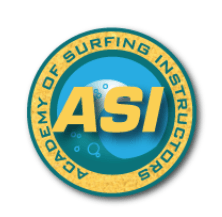 Rusty has an engineering degree so has the unique ability to break down complex patterns into small methodical bite sized elements, which means he can formulate the step by step process to implement correct surfing technique for beginners, intermediate and advanced surfers.